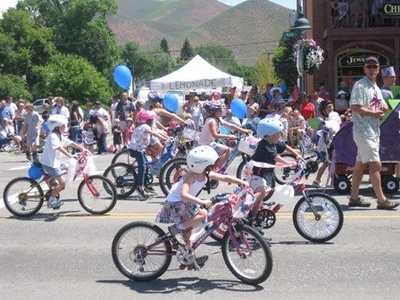 Celebrate Independence Day in Hailey and join the parade! What better way to promote your business, have fun and be part of this great American tradition! Families offer up a hot full breakfast of homemade pancakes, eggs, bacon, sausage, and more at the Grange Hall in Hailey. It’s the perfect way to fuel up for the long, fun day ahead. 9:00 AM 5K Fun Run -Tutus and Tennis Shoes - a fun run/walk to support the Sun Valley Ballet Foundation. The first 40 participants will receive a free race tutu! Your registration includes a free post-race hot dog, beer (21 and older) or lemonade. Register at www.sunvalleyballet.com. 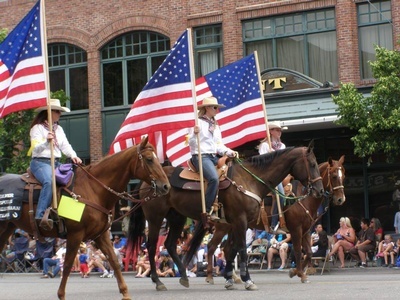 NOON: Hailey Days of the Old West Parade: Over 80 enthusiastic "Stars & Stripes. Forever"parade entrants march down Hailey’s Main Street to delight the crowd! Early Entries $25.00 (Members $20.00)by June 15th. Entrants registering on or after June 15th will pay $45.00. NOON - 1:30 PM Rotary Road Apple Roulette: The Road Apple Roulette is held each year during the 4th of July Parade. Via GPS satellite, the parade route is sectioned off into 10,000 squares that are each designated a number. If, during the parade, a horse happens to drop a "Road Apple" on your ticketed square, your name goes into a drum for the prize drawing at the end of the parade. If you have purchased multiple squares, your name is entered for each square a "Road Apple" happens to hit. The funds raised go to a variety of special causes, events, and charities that Rotary has supported over the years. 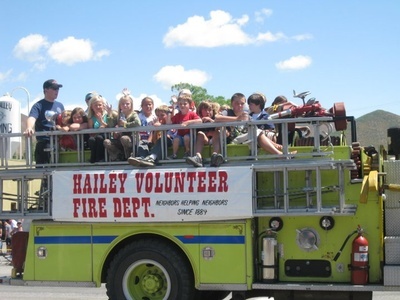 1:00 - 5:00 PM Draper Preserve RiverFest: After the City of Hailey’s July 4th parade, continue your Independence Day celebration with a stroll down to the Wood River Land Trust’s popular Draper Wood River Preserve and Lions Park for some sun and family fun. Enjoy food, music featuring “Swagger, face-painting, educational nature programs and more. New for this year will include the Sawtooth Brewery Beer Garden and all kinds of games and activities for kids. 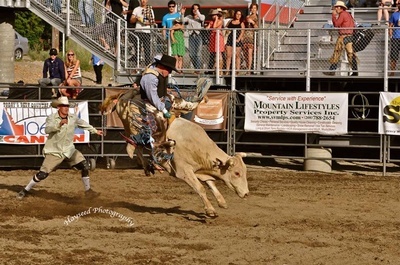 7:30 PM Sawtooth Rangers 4th of July Rodeo: Rodeo is a proud tradition in the West and in Hailey the Sawtooth Rangers have held an exciting professional rodeo, featuring some of the best riders and stock in the country, over the 4th of July every year since 1947. In 2011 the City of Hailey invested over $3 million to build a new state-of-the-art rodeo arena and grounds at the entrance to the city at Werthheimer Park to play host to the Sawtooth Rangers Rodeo as well as other events throughout the year. Tickets will be on sale at the Hailey Welcome Center and all three Atkinsons’ Market locations. Dusk - 4th of July Fireworks Extravaganza: The City of Hailey and the Valley Chamber proudly present a 4th of July Fireworks Extravaganza that is simply spectacular. Watch the show from your favorite spot on July 4, at Dusk (9-9:30pm), in Hailey and celebrate a fitting end to a fabulous 4th of July. Hailey Antique Fairs: Nothing is more fun than browsing for unique treasures at a well-curated antique show, and the Hailey Antique Fairs have some of the best antique vendors and wares in the region. You will be sure to find that perfect one-of-a-kind something! Hosted by Dana Cameron and Blue Cow Antiques. Over 30 Vendors. Benefit for Breast Cancer patients at St. Lukes Mountain States Tumor Institute. Early Entries $25.00 (Members $20.00) must be in by June 15th..
On or after June 15th - All Entrants will pay $45.00.